Is your equipment a match for your plant? Not every company has the exact same production requirements; one of the biggest areas where a plant manager might run into some issues is trying to find specific equipment to meet their specific requirements. Whether that’s finding the right machinery for their spacing requirements, budget, or projected workload, it can be exceedingly difficult for a facility manager if they don’t have the right resources. That’s why ROI offers high-quality, low-level pallet conveyors. Most of our competitors conveyors are 16” off the ground, but our low-level pallet conveyor remains at a manageable 4”, keeping z-access as low as possible. Mobile Compact Palletizer: Unique single station machine add-on that makes palletizing significantly easier. 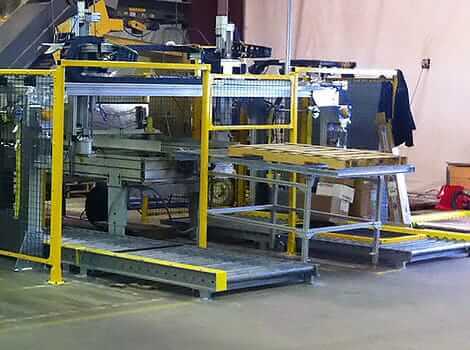 Mobile Palletizer combined with In-Process Stretch Wrapping: A high-functioning add-on that combines two specific tasks into one cohesive machine. 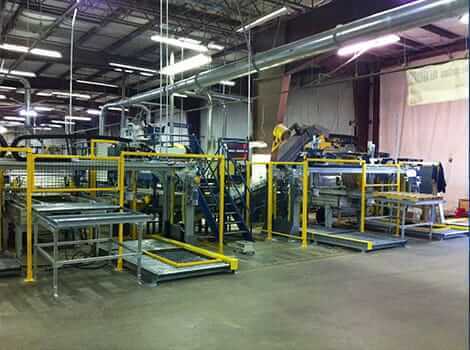 Mobile Dual Station Palletizer: Efficiently coordinates the palletizing and sorting for two unique inventory lines to create a mixed batch based on color, product, or other criteria. Mobile Compact Depalletizer: Available in each of the above-listed machines, the depalletizer is a single-station machine that can comfortably accommodate dispensers, tool changers, clamping systems, and vacuum attachments. Labor replacement by eliminating repetitive motion risks, while allowing stacking of full, stable loads to full height, minimizing freight costs. Compact, mobile footprint fits into existing tight spaces. 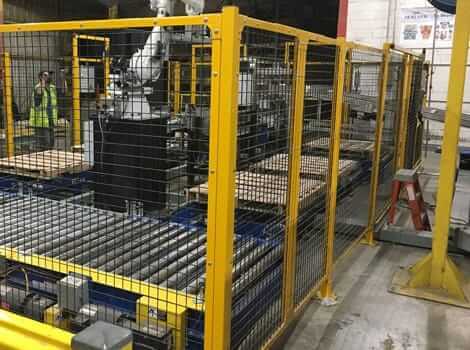 PALLETPOD doesn’t take up any more space than what is currently being used for manual palletizing, so production line reconfiguration is not required. Modular flexibility dramatically shortens project times for customers, significantly reducing customers’ use of technical resources. Immediately lowered costs with a PALLETPOD lease or rental. Online placement between shifts with limited operational disruption, with two-hour initial installation and 30 minutes of training.